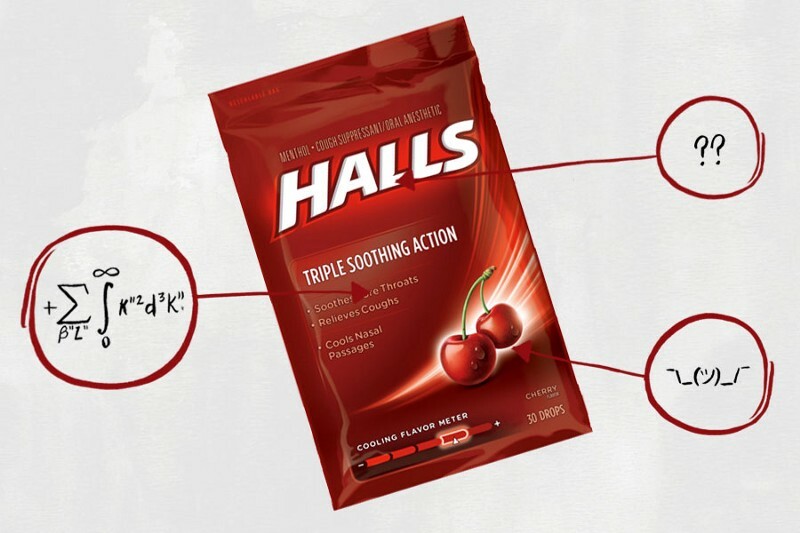 This edition: Halls Cherry Menthol Cough Drops, which are made from 10 separate ingredients that we’ve broken down in the exact order they appear on their website. 1) Menthol: Sourced primarily from peppermint, menthol has been proven to suppress cough reflex sensitivity. This is the active ingredient in these cough drops. 2) Eucalyptus Oil: Similar to menthol, eucalyptus oil possesses anti-inflammatory and analgesic effects that may help soothe a sore throat. 3) FD&C Blue 2: Artificial colors like this one are commonly considered to be carcinogenic. That said, physician and biochemist Cate Shanahan, author ofDeep Nutrition: Why Your Genes Need Traditional Food, told me during our analysis of Doritos that studies arguing this are a bit flawed: “I’ve always been of the opinion that studies claiming artificial colors can cause cancer are irrelevant because [in the studies] they use really high amounts of the artificial colors — like, a million times more than you’d ever get [in your] food [throughout your lifetime].” All in all, the average person’s liver should be able to break down whatever minuscule amount of artificial coloring we consume with food. 4) FD&C Red 40: See above. 6) Glucose Syrup: This concentrated sugar is added for sweetness. 7) Soy Lecithin: Soy lecithin is a component of fat found in (you guessed it!) soy. It’s typically added to food products as an emulsifier. In simpler terms, it helps the numerous ingredients found in these cough drops mix together. “It’s also frequently used to extend product shelf life,” Dagan Xavier, ingredient expert and co-founder of Label Insight, told me during our analysis of the ingredients in frozen breakfast sandwiches. 8) Sucralose: This is an artificial sweetener, more commonly known as Splenda. Unfortunately, studies suggest that sucralose increases the populations of bacteria in our gut that pull energy from our food and turn that energy into fat. Or in simpler terms, sucralose may make us fat. That said, there certainly isn’t enough sucralose in these tiny cough drops to plump you up. 9) Sucrose: Sucrose is just a fancy term for table sugar, which is sometimes added to medications (especially chewable tablets) to impart a sweet flavor to otherwise unpalatable chemicals. 10) Water: You (hopefully) drink this one. While there are admittedly some concerning ingredients in these cough drops — primarily the various sweeteners — they certainly aren’t served up in high enough amounts to do you any harm (each cough drop delivers an insignificant 12 calories). So enjoy your damn cough drops, and go about your day enjoying that less itchy throat of yours.